Welcome to this spacious Lancer Home that is all about entertaining in this fabulous open concept kitchen filled with lots of natural light. The tastefully updated kitchen has white cabinets with Brazilian granite counters and rich wood floors. 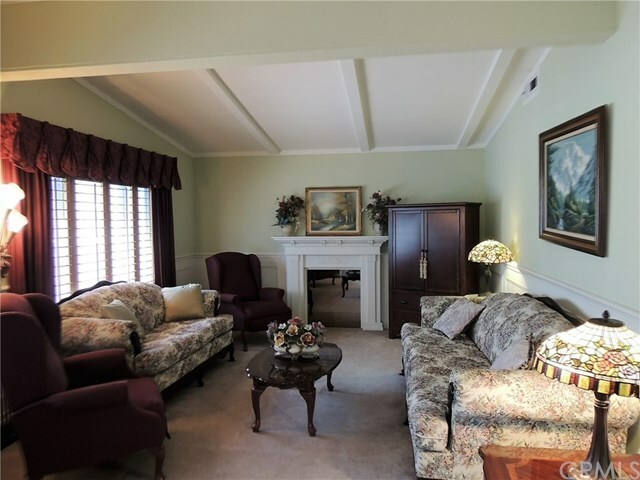 The living room has beautiful crown molding, wainscoting, and beamed ceiling to give the room an elegant feel the fireplace is nonfunctioning it's for decorative purposes only. Enjoy views of the greenbelt from outside covered patio as an extension of your outdoor living. This home has awesome curb appeal and mature landscaping. This incredible lifestyle meets senior living at its finest here at The Groves! This 55+ gated community allows residents to live comfortably The Groves is an owner-owned mobile home community. Included in the price is the home and a share in the corporation. No space rent. With all the amenities in this inclusive community with a pool, spa, sauna, BBQ and picnic area, gym, tennis courts, bocce ball court, beauty salon, gardens, RV storage and a high-pressure car wash area, banquet facilities, game room, pool tables, movie room. Many clubs to be a part of like our wood shop, travel, gardening on-site with many and much more you will need to see for yourself. This spacious home is featuring 2 bedrooms, 2 bathrooms. This home is being sold "As-Is" present condition.